Credit: Photo courtesy: Roger Barone / Wills Eye Hospital. Wills Eye Hospital's Carol Shields, MD examines patient (clinical study participant). Oncology research fellow, wearing protective eyewear, also observes. Newswise, April 3, 2017 – A first-of-its-kind, potentially groundbreaking new option for treating a form of eye cancer is now in its first phase-1 clinical research trial at Wills Eye Hospital in Philadelphia. The treatment, called light-activated AU-011, developed by Aura Biosciences of Cambridge, Massachusetts, is an investigational drug that targets and aims to selectively destroy malignant cancer cells in patients who have life-and vision-threatening eye cancer, also known as, ocular melanoma. Ocular melanoma is a malignant cancer that develops within the eye. It affects as many as 3,000 people per year in the United States. While melanoma is often associated with skin cancer from sun exposure, ocular melanoma does not relate to the sun, developing instead from abnormal pigmented cells in the eye. The danger with ocular melanoma is that there are often no symptoms, making it difficult to detect resulting in the potential of quietly spreading throughout other parts of the body. Risk factors include being Caucasian, fair-skinned, and the risk of developing the disease also increases as we age. The best way to detect ocular melanoma is to have an annual comprehensive dilated eye exam by a board certified ophthalmologist. This innovative treatment approach now being investigated at Wills Eye Hospital uses viral nanoparticle conjugates, which is a targeted therapy of growing interest in medicine. The treatment involves injecting the AU-011 investigational drug into the eye affected by cancer followed by the brief use of a companion ophthalmic laser treatment to activate the drug. The investigational drug is expected to destroy the membranes of the ocular melanoma while sparing key eye structures which may allow for the potential of preserving patients’ vision. 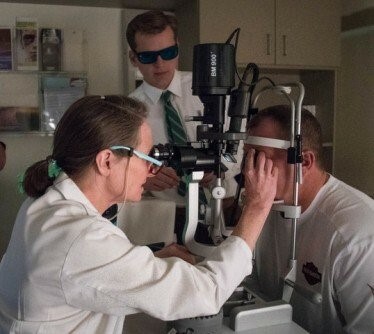 “Patients with ocular melanoma currently have few treatment options available that can effectively destroy tumor cells while preserving vision. Conducting valuable research trials like this one enables clinicians and researchers to examine new and better options for patients throughout the world,” said, Carol L. Shields, MD, Co-Director of the Ocular Oncology Service at Wills Eye Hospital where the first US patient was treated. Currently, the primary treatment option for ocular melanoma is plaque radiotherapy which was, in part, pioneered in the United States by the Shields Oncology team at Wills Eye Hospital. While that therapy has achieved high success throughout the years in tumor control for patients, this new potential targeted therapy may open the door to a less invasive method of treatment. “We are delighted to be one of the pre-eminent clinical trial sites in the nation for this unique and promising treatment. Wills Eye has always been a leader in the clinical application of emerging new therapies. We are 100% behind our world’s best oncology team,” said, Julia A. Haller, MD, Ophthalmologist-in-Chief, Wills Eye Hospital. The trial, which began in early 2017, is expected to enroll up to 12 patients at Wills Eye and other clinical trial sites. Trial investigators will focus on evaluating the safety of two dose levels of AU-011 for the treatment of patients with small to medium primary ocular melanoma. Potential participants must have a confirmed ocular melanoma diagnosis not previously treated. Patients treated in the trial will be observed and followed for 2 years. About Carol L. Shields, MD: Dr. Carol Shields is Co-Director of the Oncology Service, Wills Eye Hospital, and Professor of Ophthalmology at Thomas Jefferson University in Philadelphia. She has authored or co-authored 9 textbooks, over 1000 articles in major journals, nearly 300 textbook chapters, given over 600 lectureships, and has received numerous professional awards of major national and international standing including The American Academy of Ophthalmology Life Achievement Honor Award. Dr. Carol Shields is a member of numerous ocular oncology, pathology and retina societies and has delivered 30 named lectureships in America and abroad. She practices ocular oncology on a full time basis with her husband, Dr. Jerry Shields on the Oncology Service at Wills Eye Hospital. About Wills Eye Hospital: Wills Eye Hospital is a global leader in ophthalmology, established in 1832 as the nation’s first hospital specializing in eye care. U.S. News & World Report consistently ranks Wills Eye as one of America’s top ophthalmology centers since the survey began and has the most nationally ranked ophthalmologists in the country. Wills Eye is a premier training site for all levels of medical education. Its resident and post-graduate training programs are among the most competitive in the country. One of the core strengths of Wills is the close connection between innovative research and advanced patient care. Wills provides the full range of primary and subspecialty eye care for improving and preserving sight, including cataract, cornea, retina, emergency care, glaucoma, neuro-ophthalmology, ocular oncology, oculoplastics, pathology, pediatric ophthalmology and ocular genetics, and refractive surgery.